Lori:Leaving on a longer road trip is always a flurry of last minute activity. This time's main distractions were a Friday night dinner party we'd already decided to give, and tickets for The Magic Flute on Saturday night. We'd had a general plan for the trip, but it was to be in August. Monday night, when we discovered it wasn't too late to attend the Wilder Pageant, we made much hastier, firmer plans in a hurry. So, after the last minute rush of getting out the door, Google maps told us that taking US 22 through Weirton, WV and parts of Ohio would take two minutes longer than the freeway. So, we enjoyed driving along the Tappan Lake region as we started our trip. We had an enjoyable lunch with Michael Hoffman and Lleechef at the Gahanna Grill. Ralph tried their signature Beanie Burger. 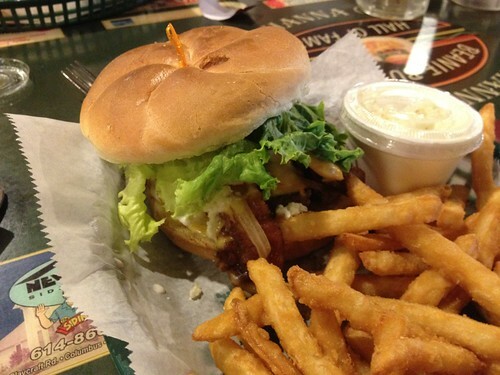 The burger has nothing to do with actual beanies, jelly beans, or the infamous beanie babies. Rather, it was named for its creator. The beanie burger is a good-sized bacon cheeseburger - we're guessing a half-pound, and it is dressed with the usual condiments plus a finely chopped cole slaw. The burger was quite good, but the cole slaw had no more personality than cream of wheat -- it neither enhanced nor detracted from the experience. The burger was good, as was Lori's bacon cheeseburger and the crisply done French fries. We liked the Gahanna Grlll and would happily return, but the great company was the best part. Next, we visited The Crayon Box, and as always, it was wonderful to see them, though our visit was too short. We spent some time chatting and Ralph tried out Apples to Apples dice with the kids. We waited out a thunderstorm, then went to a pub, Old Bag of Nails, for dinner. The food was good- we sampled the fried fish (a house specialty) and the French dip. Lori also enjoyed a cup of tomato basil soup. Dessert gave us a rare opportunity to see a deep fried snickers bar served at a table, instead of at a fair food stand. Our young friend thought it was awesome, and we enjoyed watching his delight. We'd passed on dessert, feeling full, but while making a Walgreen's stop, Ralph discovered that there was a Jeni's stop between us and the highway. Buffetbuster is right - there's always room for ice cream! 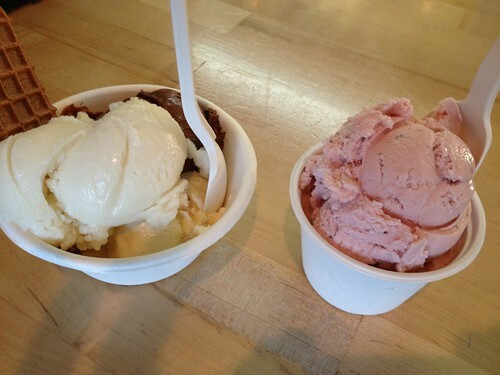 Especially Jeni's, which is one of Lori's all-time favorites. Ralph had the roasted strawberry buttermilk ice cream, which was full of rich, vibrant strawberry flavor. Lori had a sampler of dark chocolate, brown butter almond brickle, and pear Riesling sorbet. Oh, where to start? The pear Riesling has a clear, bright flavor and a mildly grainy texture that only enhances its character. The dark chocolate is deep, rich, and only mildly sweet. The brown butter brickle is full of mellow sweetness with chunks of Jeni's own almond brittle. It was a great trio, and I enjoyed it to the point of scraping the paper cup with the spoon, trying to get every last bit of the flavors. We drove through the twilight, enjoying the dark blue clouds of a far off storm, occasional flickers of lightning illuminating the sunset. We spent the night in Florence, KY, so we could visit Cincinnati for goetta in the morning.